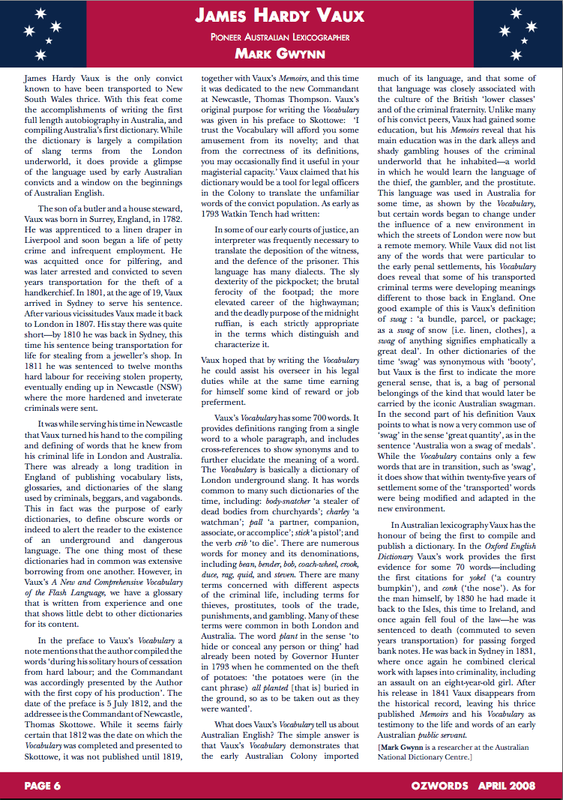 In his preface to A New And Comprehensive Vocabulary of the Flash Language Vaux mentions the reason for compiling the dictionary: ‘I trust the Vocabulary will afford you some amusement from its novelty; and that from the correctness of its definitions, you may occasionally find it useful in your magisterial capacity’. The ‘flash language’ in the title of this work refers to the language of the underclasses in British society—the criminals, beggars, and vagabonds who were Vaux’s peers in London. What makes this work stand out from similar flash glossaries and dictionaries published in this period is that it is written from personal experience. The 700-odd words in this dictionary provide an insight into the language used by convicts in the early years of British settlement in Australia. Many of the terms are those of the London criminal classes including body-snatcher ‘a stealer of dead bodies from churchyards’, stick ‘a pistol’, pall ‘a partner, companion, associate, or accomplice’. The dictionary also provides us with evidence for British words in transition, such as swag. 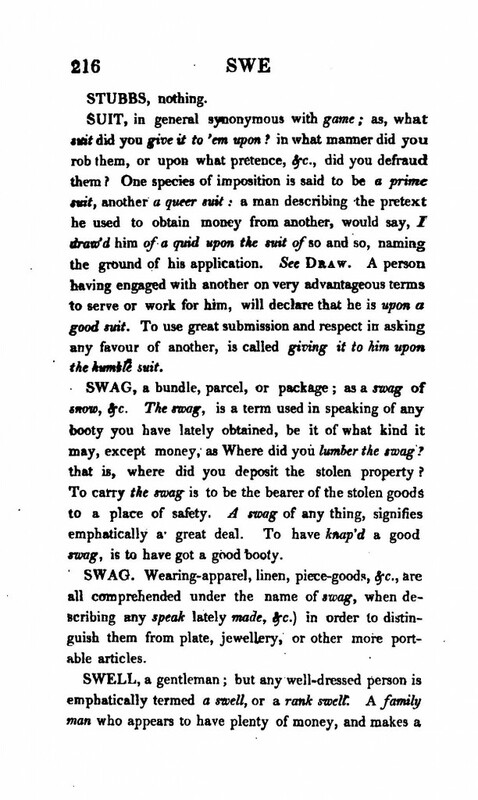 The word swag was synonymous with ‘booty’ in other dictionaries of the time. Vaux records this established meaning, but adds a new one: ‘A swag of any thing, signifies emphatically a great deal’. In Australian English this is a familiar sense in contexts like ‘Australia won a swag of medals’. 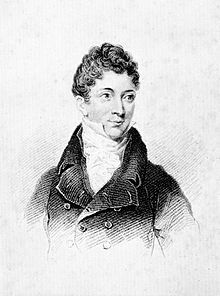 While the dictionary was presented to the Newcastle Commandant in 1812 it was not until 1819 that it was published in London with Vaux’s Memoirs. Vaux was later sentenced to a third period of transportation to Australia and after his release in 1841 he disappears from the historical record. For a more detailed account of Vaux and his dictionary see an earlier piece I wrote in our Ozwords newsletter. This entry was posted in ANDC, colonial history, historical lexicography, lexicographers and tagged flash language, swag, Vaux by Mark Gwynn. Bookmark the permalink. I.ve had a book given to me by my father in the early 1950s and was from the 1800s it was called The first australian dictionary. Where on opening the the hardcover it showed the map of Australian where today called west Australia was in the dictionary called NEW HOLLAND. Being from dutch decent it was then a conversation piece at the time. Could you please give any further information on this book as it was nothing like the hardcover books shown on the Internet. Thanking you in anticipation for any information you be able to give me. Yours sincerely, Cornelis Oppelaar. Cornelis our records, and records at the National Library of Australia, don’t show a dictionary with that title from the 19th century. Is there any chance you could provide further information about this book? In the meantime I’ll ask a few colleagues if they know anything about this book.